I was so in the mood for some good thrift store shopping yesterday. It’s been awhile since we’ve gone to our local thrifting haunt. But, I guess everyone and their sister and their children and their children’s classmates, had the same idea. The place was horribly picked over, most likely owing to the "50% off red,white and blue tags" President’s Day sale. 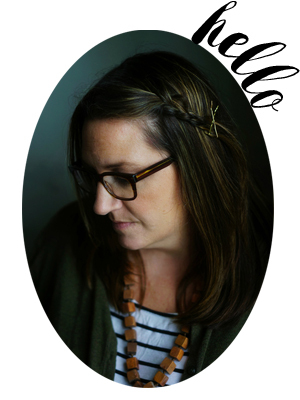 Since my children aren’t school-age yet, I often forget these little holidays and the fact that the stores and restaurants will be swamped with shoppers. What I REALLY have my heart set on finding are some wooden bowls. I feel like that’s a simple enough request–nothing fancy, but wood, please. I zeroed in on some from across the store yesterday, thinking I had scored, but when I picked them up, I quickly realized my "wooden" bowls were actually plastic look-alikes. I did manage to find this cute piece of fabric. It’s a nice heavy cotton, and the background is a really rich chocolate brown–this photo seems a little faded. But once I got it home, I decided it was more than I needed. The piece is table-cloth sized. I don’t know the exact measurements–but there’s probably a couple yards there. I’m going to keep half for myself and the other half is up for grabs. I think that fabric would make a delightful bag for summer markets. Our thrift stores always seem to be picked over. It’s depressing. what type of wooden bowls are you looking for? like the big salad-type bowls or the primitive type? the salad-type ones I have seen before around here so let me know if you want me to keep an eye out. I think cross-country thrifting is the best! it is really strange sometimes how things can be found so easily in some places and not in others! I try to keep a list of what I know people look for. New Hampshire is great for some things but not so great for others! Oh yes! Enter me!!! How sweet you are to share!!!! funny you should write about wooden bowls. my thrift has oodles- i was just looking at them on Saturday. what size are you thinking? That fabric is beautiful, please put my name in the hat. I have a shop here with smallish rice/salad size wooden bowls. Let me know if you would like some. I’m afraid I don’t have any wooden bowl insights for you. I don’t really know from wooden bowls. But I will put my name in the hat for that cool fabric. It seems you can buy anything your heart desires in nyc except thrifted items. Unless you want to call it “vintage” and pay out the wazoo for it. Oh, me, me, please enter me! It is so pretty. I’m with you on the wooden bowls. I want some in the worst way. Almost caved and got some at Ikea the other day just so I could finally own some. Hey, fabric looks great, I’m in on the drawing. I just saw an amazing wood bowl at our thrift store the other day but resisted as I DO NOT need more bowls. If it’s there next time I’ll pick it up for ya. Pretty Funky Fabric, that would make a great skirt. Too bad I don’t live in the US. Can’t wait to see what you turn the fabric into! I would be interested in it. Not exactly sure what I would do, but it would be fun to play with.! I never seem to have the luck finding fabrics at the thrift shops, but I do find some clothes. I think I’ll go today. 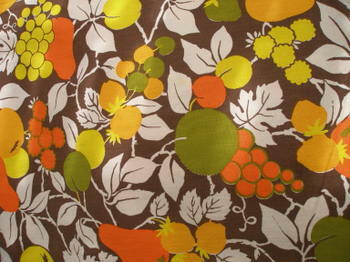 I love fruity fabrics- especially with pears! ooh, lovely little addition to my collection. I would love that fabric…to make some coasters with. Please add me to the drawing!!! is it too late to get my name in? super cute fabric! i love it! i’ll pay shipping. I’m in Virginia. thanks for the post. As for wooden bowls now idea I only have one HUGE one that I found years ago, I havent looked for smaller ones, if I find any at my thrift store I will grab them up! Want it. Need it. Gotta, Gotta, have it! Add me please. if it is not too late to enter, i’d love the fabric. I’ve been lurking here for a while, and just wanted to say hello. I love your photos and the fact that you are God-fearing. Thank you. It’s refreshing. Best wishes in your pregnancy! I’m due with my first in August, and so I can relate somewhat with the nesting thing! Me too! Me too! How fun, I love that orange and brown. So 70s. How generous of you to share.